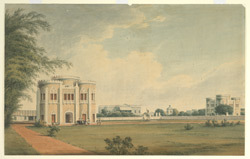 The house was built by James Brodie, an East India Company servant who was granted 11 acres of land on Quibble Island in the estuary of the Adyar River at Madras. ‘Brodie Castle’ is an imposing white structure flanked by twin castellated turrets set on either side of the main house. Brodie drowned in the Adyar River in 1802.